There is a certain point, as winter nears its end, that I simply must have a taste of spring. We’ve had an exceptionally warm winter this year. I think we had two major snowfalls. Yet, I am absolutely craving spring. Sometimes, there is a need to take matters into your own hands. So, the girls and I made a trip to our local hardware store and picked up a few tropical plants – plants that I knew we could use in a spring flower centerpiece. 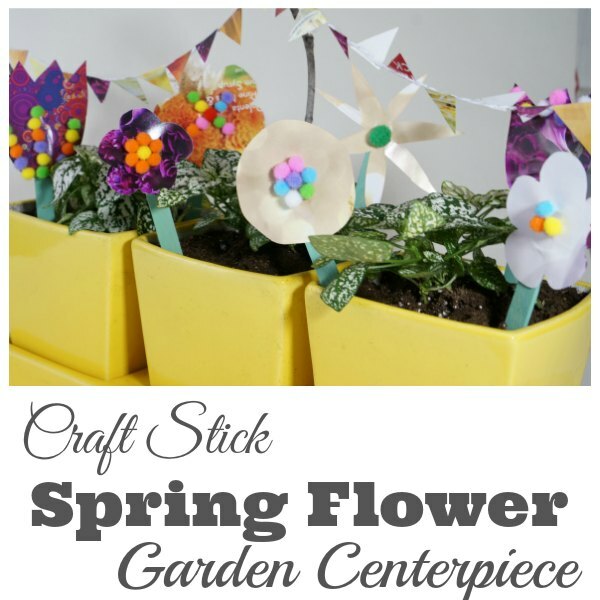 With the addition of a few craft stick flowers, we created a centerpiece that is bringing springtime happiness to our dining room table. 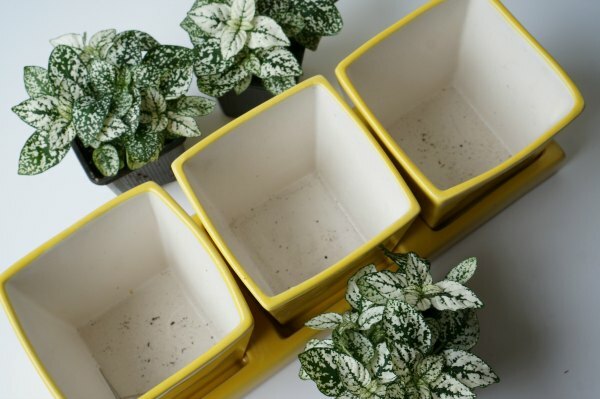 Start off by dusting off an old plant container. We happened to have this cheerful yellow container kicking around in the basement. The bright colour made it the perfect vessel for this job. 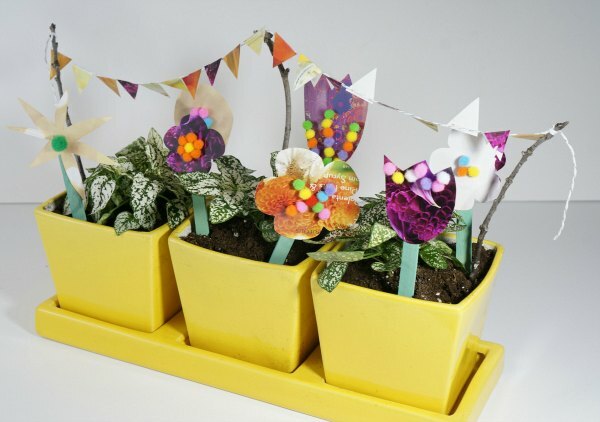 Next, purchase a potted plant for your container. We chose these little tropical plants (that only cost $1.99 each) at the hardware store. Pick a plant that has interesting folliage, because you are providing the beautiful flowers. Alternately, use a house plant that you already have. 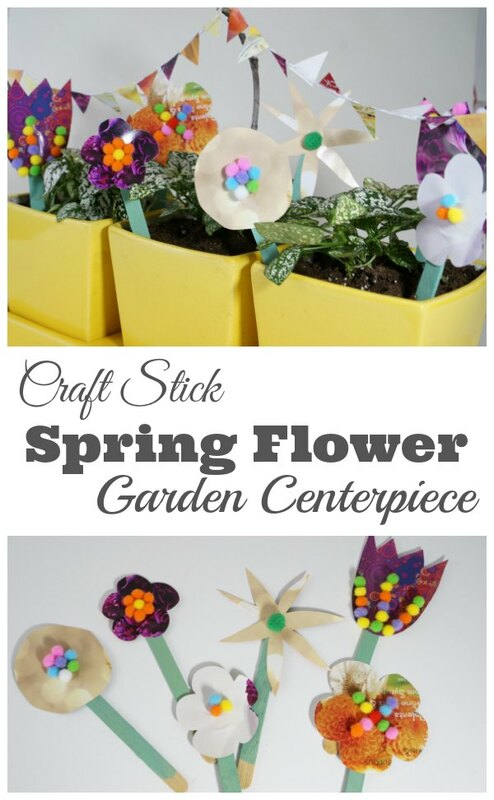 For the flowers, start by painting the craft sticks green. 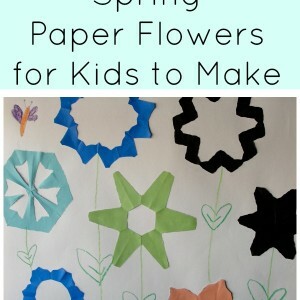 While the sticks are drying, cut flowers of all shapes and sizes out of scrap magazine pages. We keep a pile of old magazines for crafting purposes. 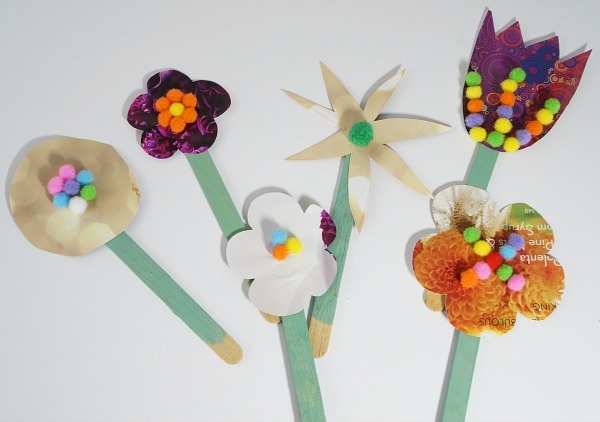 Use a dab of white glue to adhere the flowers to the sticks. Once the flowers are dried, it is time to add some sparkle. We used the white glue to adhere fuzzy little pom poms to our flowers. 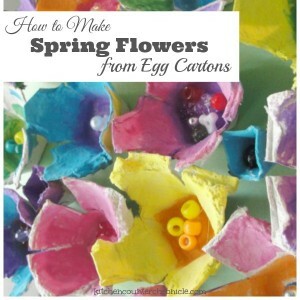 Remember to make your flowers as colourful and fun as possible. When the flowers have completely dried, poke them into the planter. 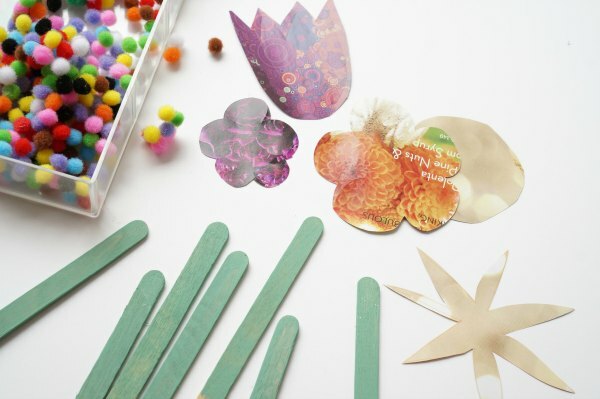 For our festive spring bunting, we poked 3 twigs from our garden into the container. Wrap and tie the string to the twigs. We even used a natural notch in the middle twig to secure the string. Cut a piece of string to stretch comfortably from twig to twig. 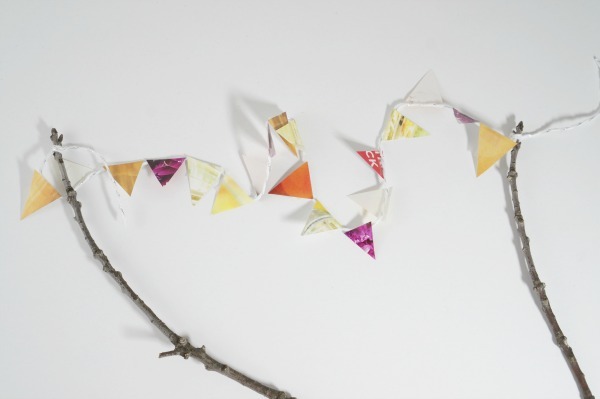 Cut triangles from the magazine scrap paper and tape the triangles onto the string. Tie the string onto the twigs. What a cheerful addition to our kitchen counter. We are working on a few other funny Easter additions that we will be adding soon. 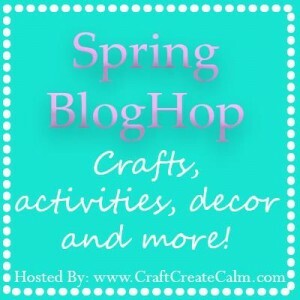 Today’s post is part of the Spring Blog Hop being hosted by Craft Create Calm. 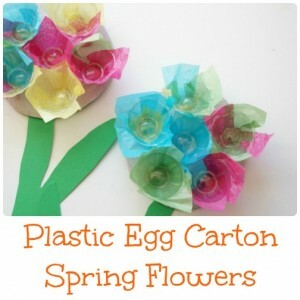 Head over and check out all the beautiful spring crafts being shared.